Dr. Baljeet Kaur Waan is an expert Anaesthetist for advanced Lap/Open Gynae, General & Bariatric surgeries and a Pain physician with vast experience of over 22 yrs. 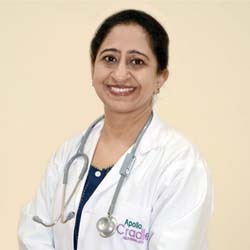 Presently she is working as HOD Anaesthesia Apollo Cradle, Amritsar She graduated from SPMedical College, Bikaner in 1989 and completed her MD from same college in 1995. She did her Fellowship in Pain Management from Sir Gangaram Hospital, Delhi. She was working as senior Consultant, Intensivist and Pain physician at Ivy superspeciality hospital, BEAMS hospital, Smt Paarvati Devi Hospital, Dhaliwal hospital, Madaan hospital and S Waryam Singh Hospital Amritsar. She has been invited as faculty in workshop on Labour Analgesia. She is an expert in conducting anaesthesia for painless deliveries and various pain relieving procedures in addition she is giving anaesthesia efficiently and safely for Lap gynae, general, bariatric, neuro, ortho and urology surgeries. She focuses on high standards of medical care,patient safety and comfort of every patient.